This strand is concerned with the social ambience of jazz.� It is often stated that the music is influenced by the world around it.� What about reversing this idea and exploring how jazz influences society?� Within this strand we are going to look at festivals and venues in particular and the way in which they are used to promote a sense of civic pride or cultural tourism. 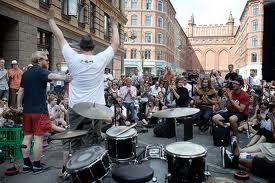 Given that jazz cultures are influenced by their social settings, how do they, in turn, influence social ambience, e.g. in the form of public manifestations of cultural or historical remembrance; jazz festivals, archives, venues, school curricula etc.? This strand explores the cultural dynamics of jazz and the relationship between jazz practice and its social settings.� The relationship between identity and inheritance, cultural practices and the social settings of jazz will afford a multi-faceted perspective on the dynamics of European culture.� Given that jazz cultures are influenced by their social settings, it is necessary to examine how they, in turn, influence social ambience in national, regional, urban and regional settings.� Within this context, jazz festivals, jazz archives, educational curricula and performance venues take on many forms across different European settings and play an integral part in manifestations of historical remembrance, cultural practices and different types of cultural tourism. By applying the research to broader contexts, it will also be possible to gain insights into the relationship between past and present, challenging Europe�s perception of itself by exploring transnational identities and the contexts where cultural change occurs.